A well-attended celebration of this year’s five new pamphlets took place on 26th November at Lancaster Library, with engaging readings from Jane Routh (The White Silence), William Gilson (Monkey Puzzle), Mark Carson (Hove-to is a State of Mind), Rebecca Bilkau (Choosing New Omens) and Alan Rice (Elizabeth Burns’ husband who read from Clay). 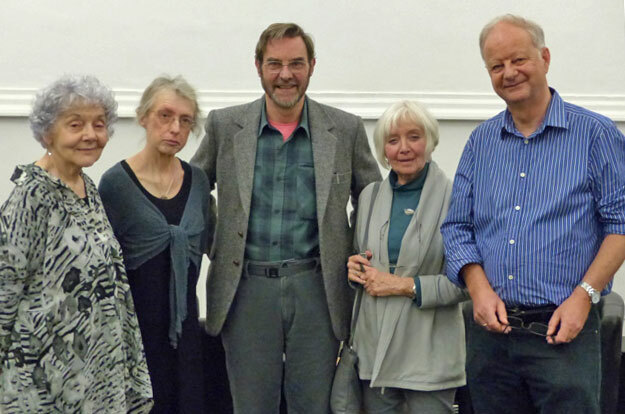 Wayleave Press launched its first four pamphlets on Friday 5th December 2014 with excellent readings by Ron Scowcroft, Elizabeth Burns, Pauline Keith and Carole Coates. Lancaster City Library kindly hosted the event, upstairs in The Sanctuary. Having anticipated an audience of between 30 to 50, in the event extra chairs had to be found for an enthusiastic and appreciative 70. Pamphlets flew off the table. The look of the pamphlets set out all together resulted in many people buying the whole set. So, thanks to Liz Cox and her staff at Lancaster City Library for the venue, sound system and backlighting; to Carole Coates’ sister Criss Sandom for wine and drinks; to Sarah Hymas for taking over serving drinks; to Andrews of Bentham, the printer, for the beautifully made pamphlets; to Jane for doing the books; to Carol Scowcroft for the photos. And the audience for coming and making it such a successful event for a new venture. But most of all thanks to the four poets for giving such fine readings. It felt as if Wayleave had arrived in the poetry landscape.